Could you make this in a house? Can you make this with a mouse? You could make this at any house. You could even design a mouse! Some people could even make a plane! We made this perfect TRAIN! It's pretty obvious that when you talk to a hair bow maker that the girls get all the goodies, and the boys... well, they don't really get their fair shake in this deal. I thought we better make a boy project before my son starts hiding my good scissors in protest! Before getting started it is highly recommended to wash any fabric and clothing you are going to use. Different fabrics can and will shrink at different rates when washed. Better for it to do its thing before you put all the work into it and avoid all the tears! First, go ahead and plug in your iron and get it nice and hot. Iron all the fabric you plan on working with. Now turn your iron temp down to a medium heat setting. 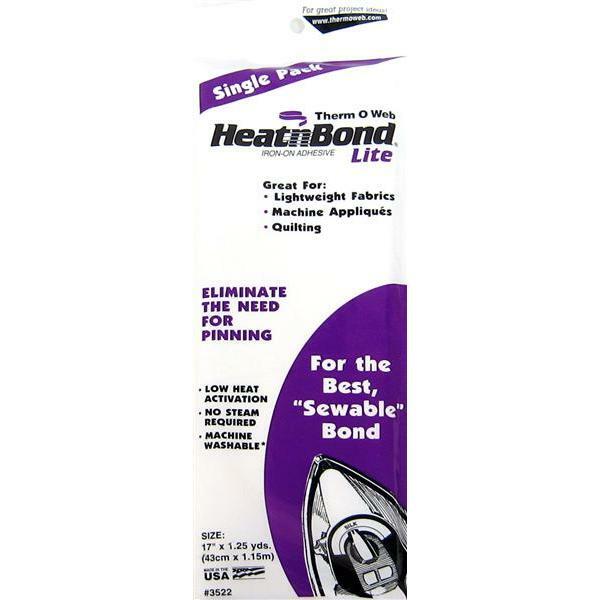 Now is a good time to evaluate when to apply your heat and bond to the fabric. Heat and bond will be the glue that is going to hold your fabric to your other fabric. The Heat and bond will also keep your fabric from fraying where it is applied. If you are cutting out an intricate shape or want your heat and bond to go right to the edge of your design then you will want to apply that to the fabric area you will be working with before cutting it out. We did this a little backwards in this project because our plan was to fray the edges of the rectangles, and rectangles are easy to cut out. We left a margin on the outer edge without heat and bond for decorative reasons. I am outlining my steps but feel free to flip this around to suit your needs. Cut out your shape from the fabric that will be used on the top design. Place that shape on top of the accent fabric that will be underneath the main design. Cut out your second shape leaving the desired amount of the second fabric to frame and accent your top fabric. Turn both shapes wrong side down on your table and cut out your heat and bond to fit the desired area. The heat and bond will have a paper backing on one side, and a textured gluey side on the other. 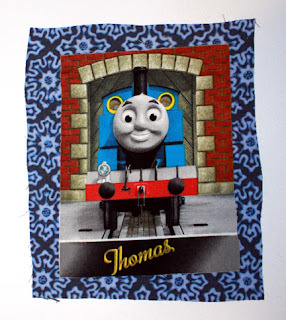 Make sure the paper backing side is facing up and the texture side is facing the fabric. Follow your package instructions by ironing with no steam for a few seconds over your heat and bond area to achieve a good hold. Let the area cool for a bit until it’s not warm to the touch. The paper should easily peel off when properly adhered. If it doesn't, don’t fret, and don't force it. Just iron it a little bit more and try again. ONLY PEEL OFF THE PAPER FOR YOUR TOP FABRIC. Place your top fabric with the paper peeled off in position on top of what will be your bottom accent fabric. Iron together. Sew around the top design. 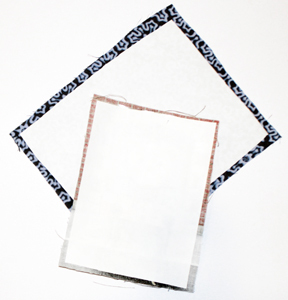 We added our bias tape to frame our image during this step by placing it on the edge of the design and sewing in place. Peel off the backing on the final shape. Iron to your clothing item. Stitch around the outside edge as desired to finish. If you are sewing into a knit remember to change to a ball point needle. 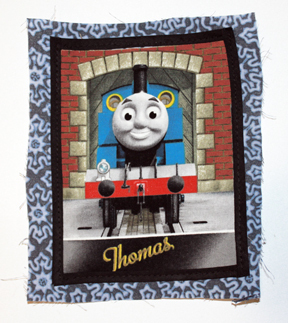 We then frayed the edges of our accent fabric which as it washes will continue to get a soft frayed look to it. It was the sweetest thing. 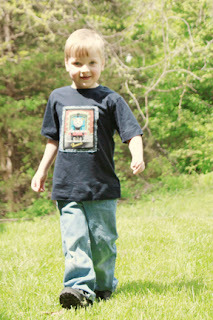 Mr. Man ran around all day telling everyone, "Look MOMMY made my THOMAS SHIRT!" Who could get a better Mother's Day present than that? This is great! I have been trying to attempt this for quite some time, but I am new to sewing. 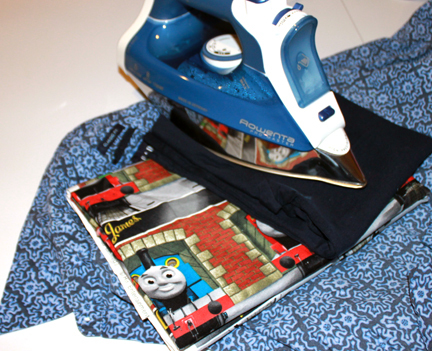 When ironing the fabric with heat n' bond to the shirt, do you just do it fabric side up, or is it done inside out? Another problem... I don't have a sewing machine :( Any way to do it without sewing?! @Wendy - Dev sure looks like he loves it! @Faigie, you want to iron the heat n' bond to the wrong side of the fabric. As far as doing it without a sewing machine. It is possible, just tedious and takes awhile. 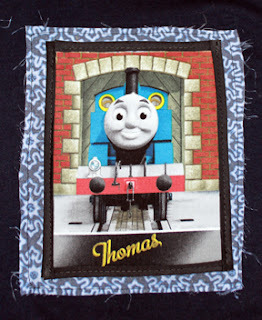 But you can get perfect stitches and not have to worry about lining anything up on the machine. Good luck! You want to apply the heat and bond to the wrong uglier side of the fabric. That side will go face down with the adhesive heat and bond towards your shirt, then you iron it again to attach to the shirt. 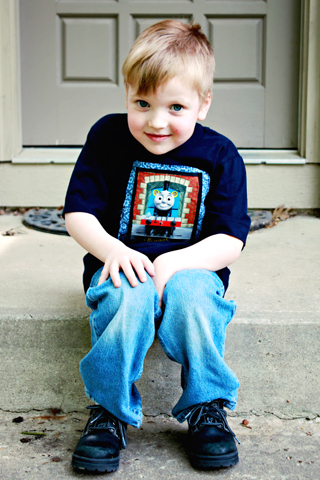 Think of the heat and bond like the peanut butter in a sandwich :) You can hand sew around the shape you are making. I have seen some really neat project done like that at fairs! Great project; I've always wanted to try it but never had a chance. Thanks!